"Every time we have a church supper, I have to make this. It's a favorite!" 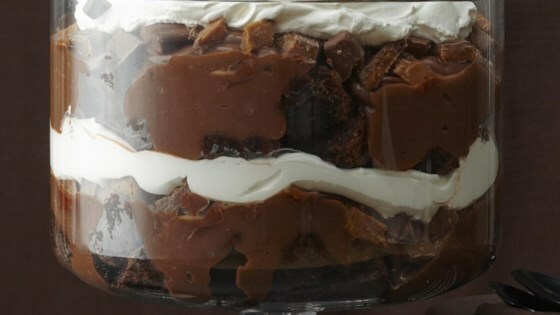 In a glass punch bowl, layer in the following order: 1/2 of the brownie, crumbled; 1/2 of the pudding; 1 toffee bar, crushed; 1/2 of the whipped topping. Excellent! The only additional thing I added was caramel ice cream topping in each layer. Yummy!! I made some modifications to this recipe to make it low fat. I used Fat free pudding & Cool whip. I also found a low fat brownie mix & then used a low carb candy bar. It was delicious! This is exclusively for chocolate lovers! It's so good! I poke holes in my brownies and pour 1/2 cup Kahlua into my brownies. Cover and soak overnight.